A metal fractionation study on bed sediments of River Narmada in Central India has been carried out to examine the enrichment and partitioning of different metal species between five geochemical phases (exchangeable fraction, carbonate fraction, Fe/Mn oxide fraction, organic fraction and residual fraction). The river receives toxic substances through a large number of tributaries and drains flowing in the catchment of the river. The toxic substances of particular interest are heavy metals derived from urban runoff as well as municipal sewage and industrial effluents. Heavy metals entering the river get adsorbed onto the suspended sediments, which in due course of time settle down in the bottom of the river. In this study fractionation of metal ions has been carried out with the objective to determine the eco-toxic potential of metal ions. 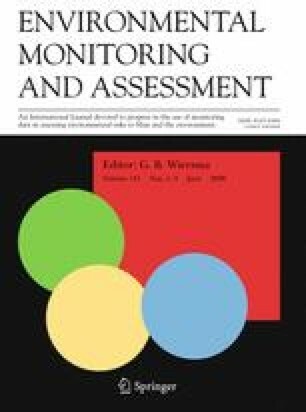 Although, in most cases (except iron) the average trace/heavy metal concentrations in sediments were higher than the standard shale values, the risk assessment code as applied to the present study reveals that only about 1–3% of manganese, <1% of copper, 16–19% of nickel, 4–20% of chromium, 1–4% of lead, 8–13% of cadmium and 1–3% of zinc exist in exchangeable fraction and therefore falls under low to medium risk category. According to the Geo-accumulation Index (GAI), cadmium shows high accumulation in the river sediments, rest of other metals are under unpolluted to moderately polluted class.